The Alaska Department of Transportation and Public Facilities will host a public meeting from 5-8 p.m. on Wednesday, Jan. 18, at Harrigan Centennial Hall to discuss a proposed project on Halibut Point Road. According to the public notice from DOT, the original project plan was completed in August 2011. But recently concerns have been raised by Sitka resident Harvey Brandt and others about whether or not there are adequate bicycle and pedestrian facilities along the road. DOT said it already has made some revisions to its plan by adding pedestrian facilities to the Granite Creek and No Name Creek bridges, but it also said funds were limited for this project and some bike/walk concerns might not be addressed until a future project. The following is part of an e-mail from DOT SE Region Engineering Manager Keith Karpstein (465-1796). Thank you all for your comments related to the proposed improvements planned for Halibut Point Road (HPR). I apologize for the late response, but it has taken me longer than expected to track down the necessary information in order to respond. Most of your comments expressed concerns regarding the lack of pedestrian facilities along HPR from SeaMart to the Starrigaven Campground. Although we do recognize the need for these facilities, these improvements are not included in the scope of work for the upcoming project scheduled to begin construction in the summer of 2012. We have two things to contend with, budget and schedule. The funding currently programmed for this project does not include those improvements and additional funding would have to be secured. As for timing, including those improvements at this time would require that we develop a preliminary design and complete a new environmental document, which may take up to one year. Our construction funding must be obligated by the end of this federal fiscal year, which requires us to have the project ready to advertise by the end of August. If we are not able to obligate the construction funding by that time, we are at risk of losing the funds to another project that is “shovel” ready. That is not a risk we are willing to take for the community, or region as a whole. We are, however, able to include pedestrian facilities across Granite Creek and No Name Creek bridges to accommodate future pedestrian facilities along the road. In addition, since we do recognize the need for pedestrian facilities along HPR, we are developing a project scope and cost estimates that could assist in a future project nomination. A project of this type would have our support. Some commenters also expressed maintenance concerns along Halibut Point road; this project includes improvements to address those concerns. These improvements include paving beneath the guardrail to minimize vegetation growth; providing pavement aprons at all driveways to minimize gravel track-out onto the shoulder; replacing guardrail to meet current standards; installing safety end terminals on all guardrail ends where required; and repairing the subgrade at several locations where the pavement has settled. Drainage improvements are also included within the scope of the upcoming project. To clarify this information and to answer any questions you have, I am planning on having a public workshop on January 18, 2011 at Centennial Hall from 5 pm to 8 pm. This is a great opportunity for us to hear from all of you who drive, bike, and walk this road every day. I look forward to meeting you and working with you on our upcoming projects. The project will start at the roundabout in downtown Sitka and follow 7.3 miles of Halibut Point Road to the end of existing pavement at Starrigavan Bay Campground. The plan is to repave the road, while also repairing or replacing existing sidewalks, culverts, storm drains, guardrail, and other roadside features. 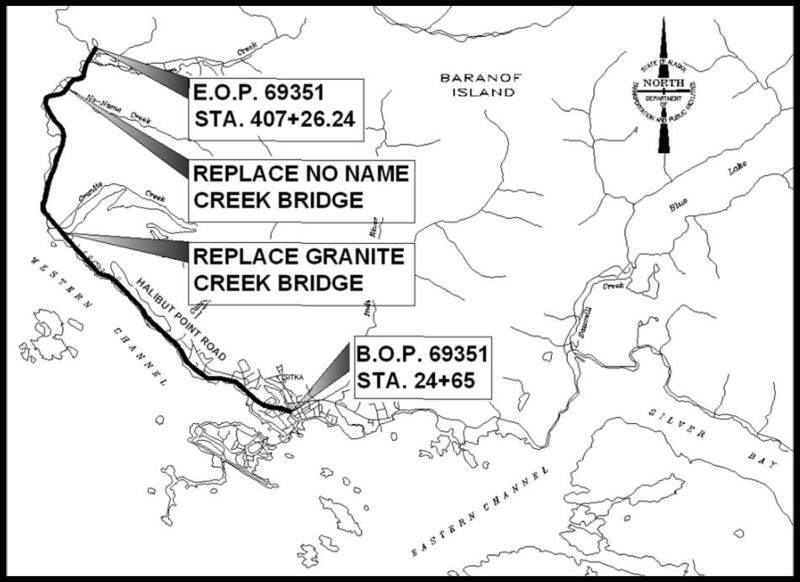 It also will replace the Granite Creek and No Name Creek bridges, and it will add or relocate bus pullouts. The meeting will be in an open house format, with the first part used to give people time to find out more about the project by looking at charts and maps. The main part of the meeting will start after people have had time to review the displays. DOT staff will be available to discuss the project, answer questions and take public/written comments. 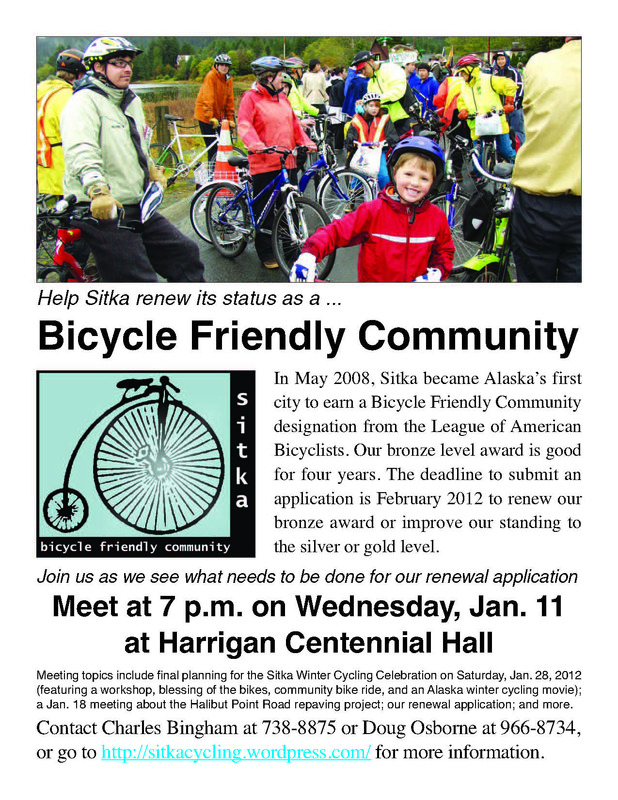 The Sitka Bicycle Friendly Community Coalition will meet at 7 p.m. on Wednesday, Jan. 11, at Harrigan Centennial Hall. Meeting topics include final planning for the Sitka Winter Cycling Celebration from 10 a.m. to 2 p.m. on Saturday, Jan. 28, at Harrigan Centennial Hall and the Crescent Harbor shelter (with a bike workshop, blessing of the bikes by local clergy, community bike ride through downtown Sitka, and a showing of the award-winning movie “Fat Bike” by Anchorage’s Carl Battreall about winter mountain biking in Alaska); an update on the state’s planned Halibut Point Road construction project (the Alaska Department of Transportation has scheduled a public meeting planned for 5-8 p.m. on Wed. Jan. 18, at Harrigan Centennial Hall); our new bike safety media campaign; and other items. The coalition also will discuss getting all the necessary information for our renewal application for a Bicycle Friendly Community award, which is due to the League of American Bicyclists in February 2012. In May 2008, Sitka became the first community in Alaska to earn a Bicycle Friendly Community designation from the League of American Bicyclists. Since Sitka received its bronze level BFC award, good for four years, Anchorage and Juneau also have received bronze awards. Several businesses in Alaska, including the Sitka campus of the SouthEast Alaska Regional Health Consortium (SEARHC) have earned Bicycle Friendly Business designations from the League of American Bicyclists. To learn more about our application process and what we need to be renewed as a Bicycle Friendly Community, please attend the meeting and/or watch this site. For more information, contact Doug Osborne at 966-8734 or doug.osborne@searhc.org, or contact Charles Bingham at 738-8875 or charleswbingham3@gmail.com. Lois den Herder, an occupational therapist at the SouthEast Alaska Regional Health Consortium (SEARHC), gets on her bike at S’áxt’ Hít Mt. Edgecumbe Hospital so she can ride home from work after her shift ended on Thursday, Dec. 15, 2011. Note the reflective tape on her fenders and bike frame. Reflective tape on your clothes and bike help cars see you when you ride your bike during the dark winter months. Lois also is wearing rain pants, XtraTuf rubber boots, a scarf around her neck, a bike helmet for safety, gloves and a winter jacket to stay warm and dry during her ride. If you do plan to ride in the winter, please wear bright, reflective clothes and have a strong white headlight and blinking red taillight. 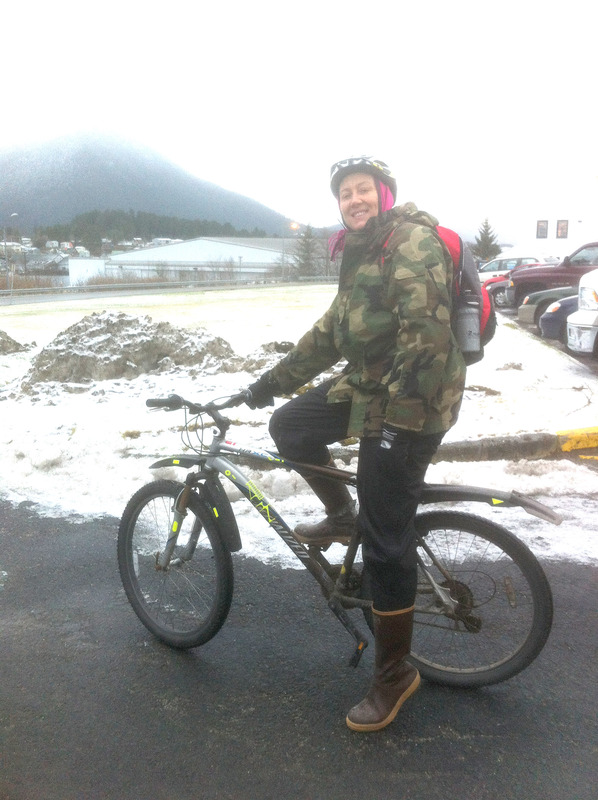 Also, many people find studded mountain bike tires work well on Sitka’s icy roads. 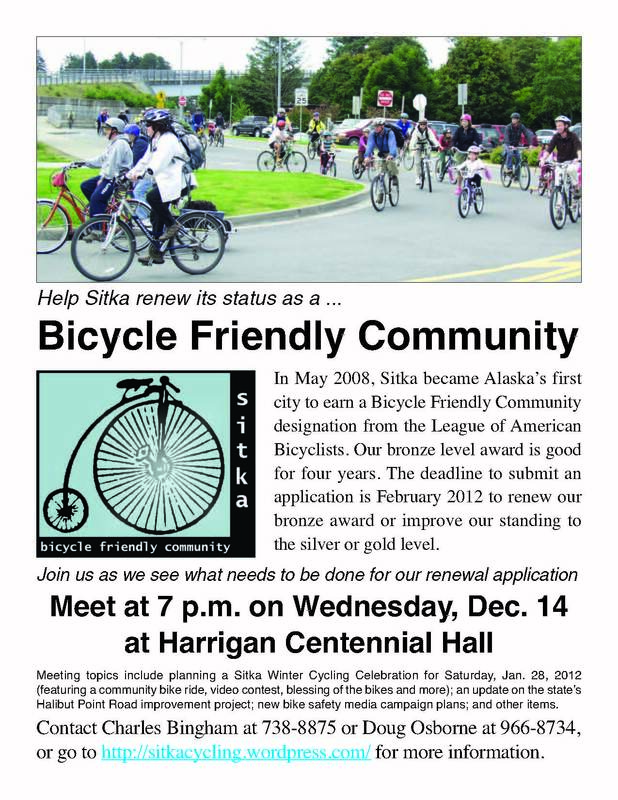 The Sitka Bicycle Friendly Community Coalition will meet at 7 p.m. on Wednesday, Dec. 14, at Harrigan Centennial Hall. Meeting topics include planning for a Sitka Winter Cycling Celebration on Saturday, Jan. 28, 2012 (with a community bike ride, workshop, video contest, blessing of the bikes and more); an update on the state’s planned Halibut Point Road construction project; our new bike safety media campaign; and other items. The coalition will discuss upcoming bike workshops and events. It also will work on getting all the necessary information for our renewal application for a Bicycle Friendly Community award, which is due to the League of American Bicyclists in February 2012. In May 2008, Sitka became the first community in Alaska to earn a Bicycle Friendly Community designation from the League of American Bicyclists. Since Sitka received its bronze level BFC award, good for four years, Anchorage and Juneau also have received bronze awards. Several businesses in Alaska, including the Sitka campus of the SouthEast Alaska Regional Health Consortium (SEARHC) have earned Bicycle Friendly Business designations from the League of American Bicyclists.